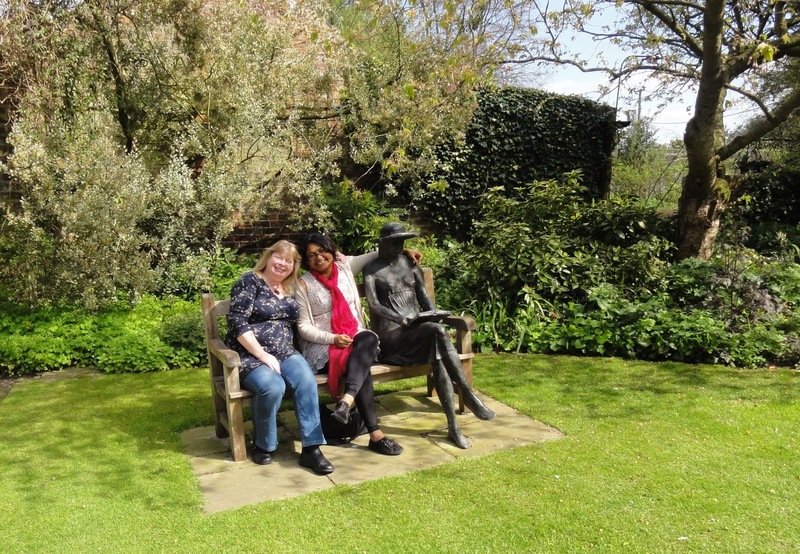 It was Easter holidays, my friend Manishta was visiting from Oxford, and it was sunny: a perfect combination for garden visiting. 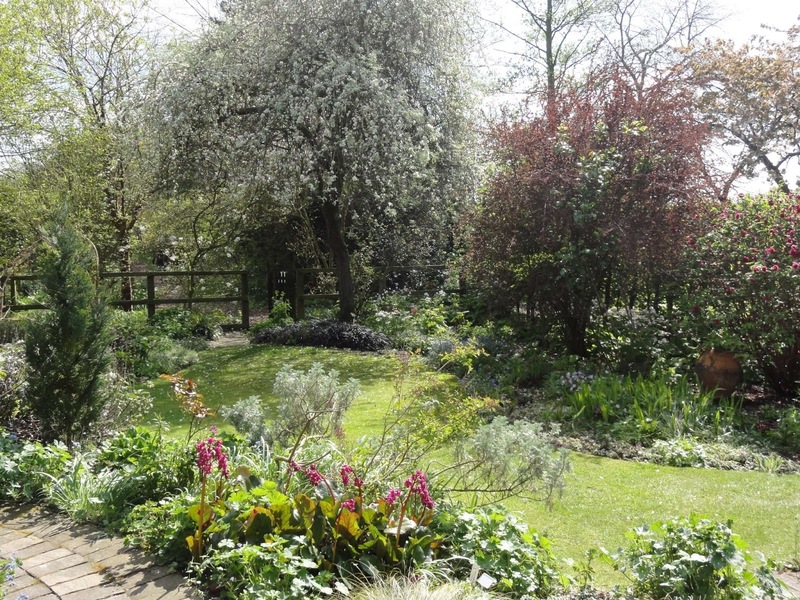 My choice was Stillingfleet Lodge Gardens, which lies just south of York. 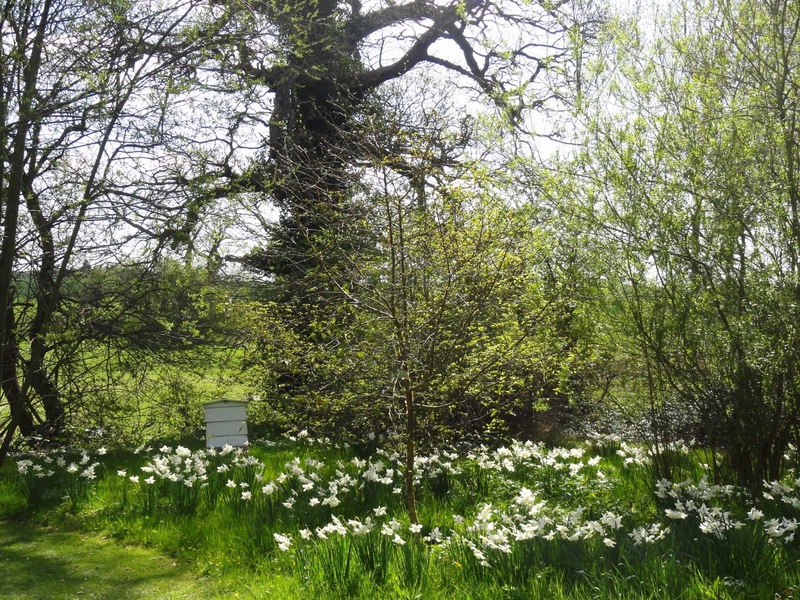 I follow Stillingfleet on Twitter @SLGardens and had seen photographs of the gardens which piqued my curiosity. 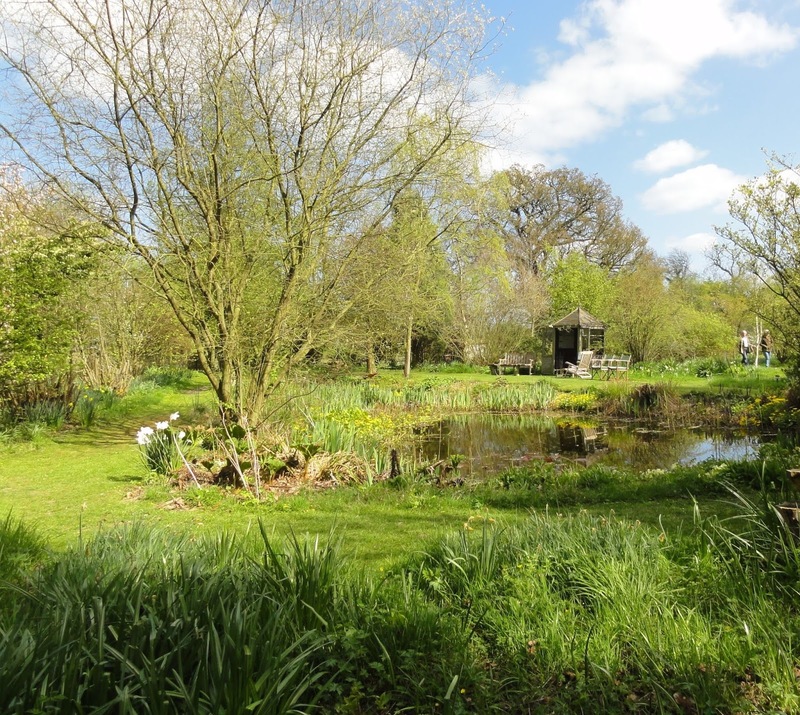 Stillingfleet Lodge Gardens is presented as a series of 'garden rooms', a majority of which combine classic garden rooms such as the orchard, the avenue and the woodland walk, with a sense of lush casualness to the planting. The overall effect is a tranquil yet lively garden, allowing the visitor to take their time and relax into the space, whilst being alive with bird song, bees buzzing and a gentle breeze through the trees. 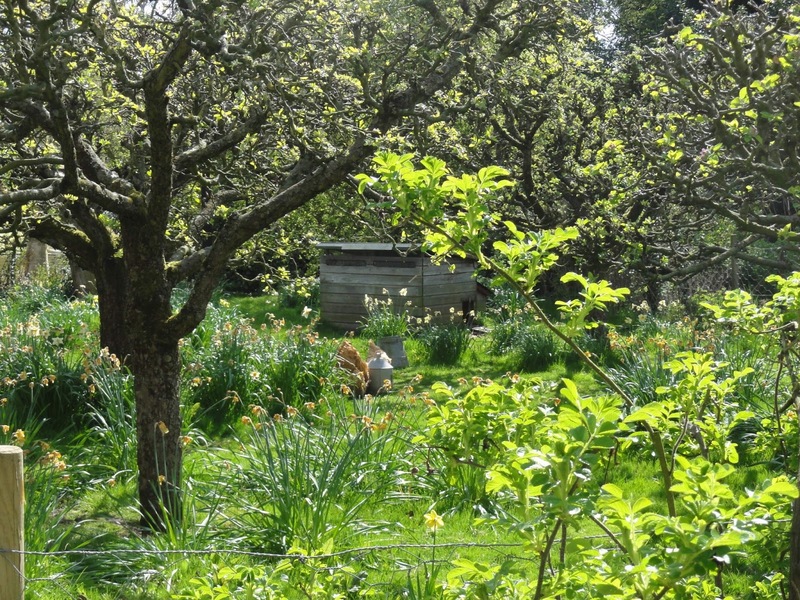 The orchard greets you as you arrive, with chickens scurrying about clearing up any pests. Well, pests to the gardener, a delicious meal to the chicken. 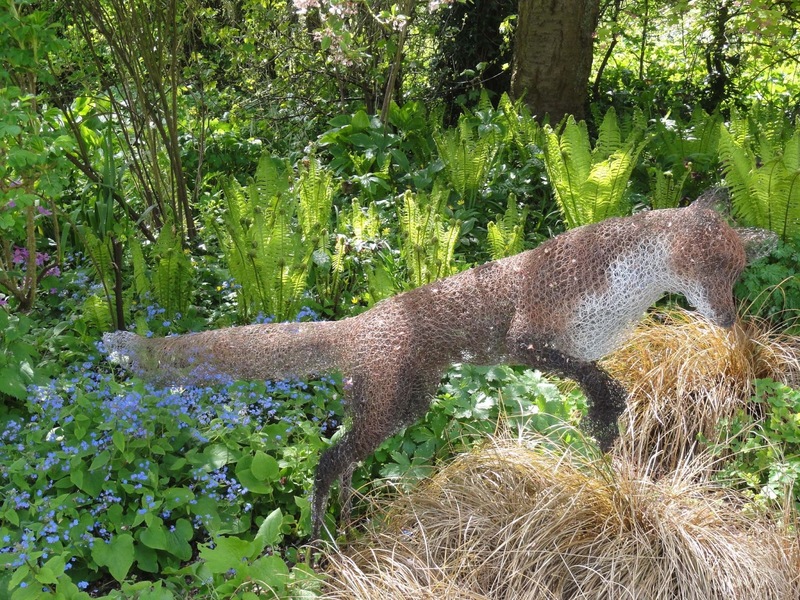 Past the stock beds you come to lush shady planting complete with a chicken wire fox (chicken wire, fox, ha ha ha). I love how the artist got the colours and shading of the fox so right. The shuttlecocks of the emerging ferns glowed in the dappled light, and the blue of the brunnera reminded me that I really must get this for my shady border. The green leaves beautifully enhance the blue flowers. Yes, a common plant, but that doesn't mean it cannot be a beautiful one. In the Courtyard garden, Manishta and I joined the reading companion for brief sit-down. 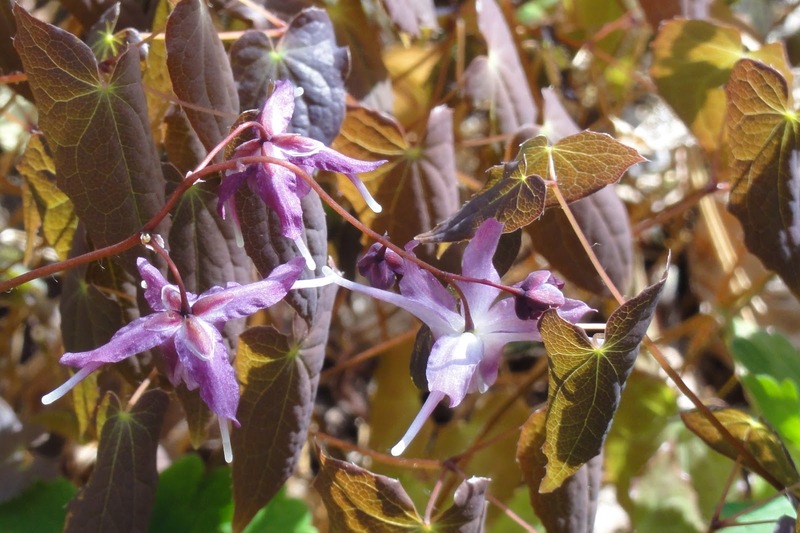 The borders were filled with plants that enjoyed dappled shade, such as this gorgeous Epimedium. The Courtyard garden contains the help yourself cafe, with lovely fresh fair trade cake made by people in the village. The cake was so good that we went back for seconds... On the side of the building (an old barn) were steps leading up to a door, accompanied by pots of sunny coloured pansies. 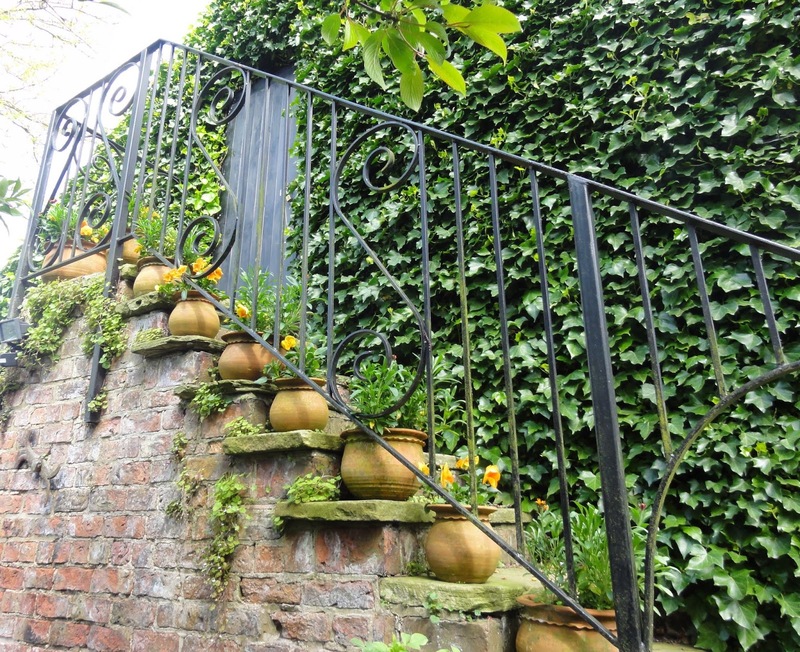 The pots of pansies just gave that extra bit of detail which enhanced the romantic-like nature of the space. The Rill garden was perhaps the only garden that didn't really work for me. It was tranquil, but too formal and somehow appeared out of character when compared to the rest of the gardens. 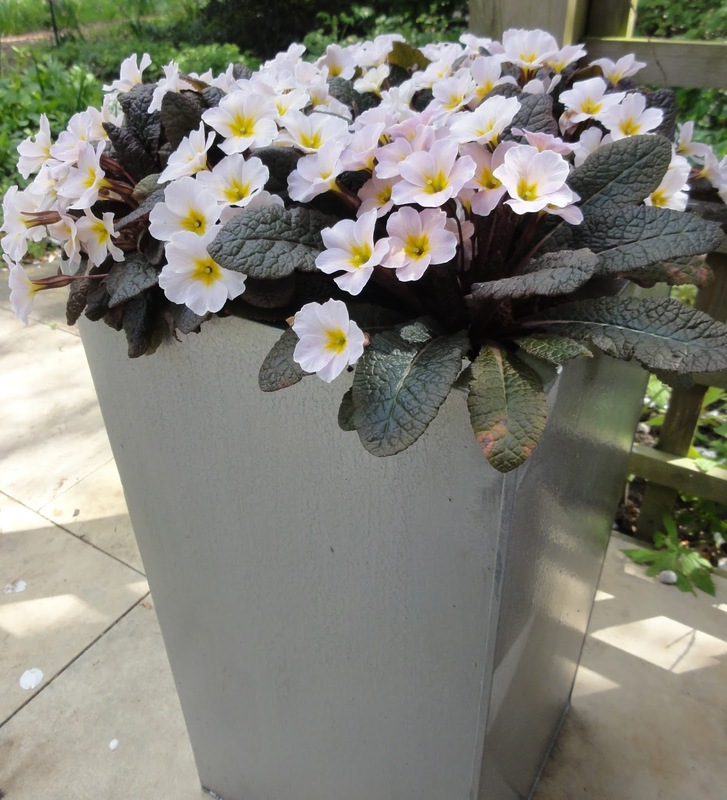 I didn't think to photograph it, only this planter with a Primula (Guinevere? ), which I did like. The Pear Tree garden, next to the Rill garden, returned to the lush borders that I preferred. Whilst one end of the Pear Tree Garden gave shade (above), the other end was a sun trap (below). 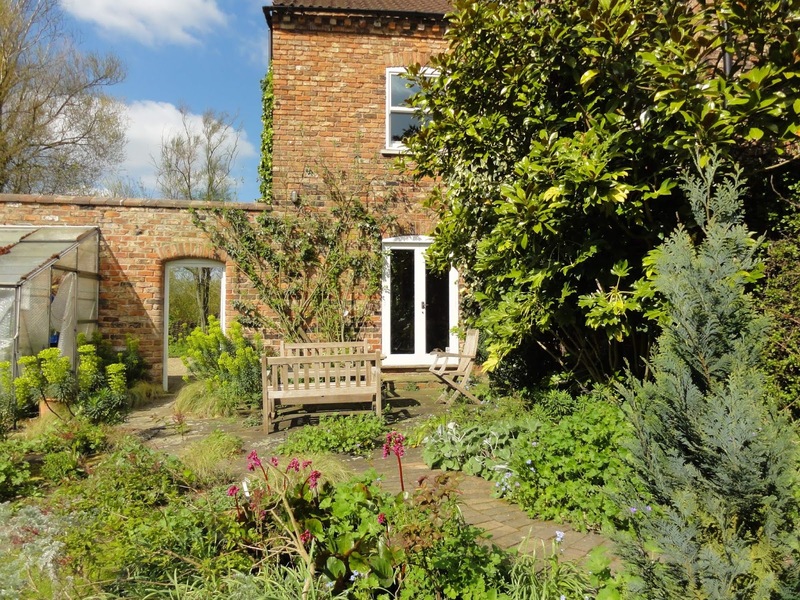 You could just imagine eating your breakfast at the table, enjoying the sun and plants at the start of the day, before the garden visitors arrived. 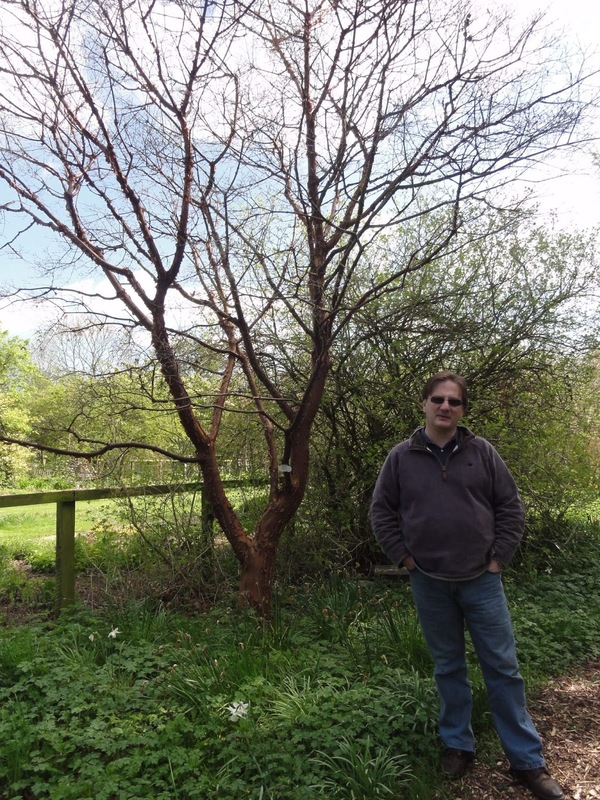 In the Woodland walk we came across a tall Acer Griseum. From personal experience I know this is a very slow growing tree, so the fact that it was that tall suggested it must have been planted early on when the garden was first started, in 1975. 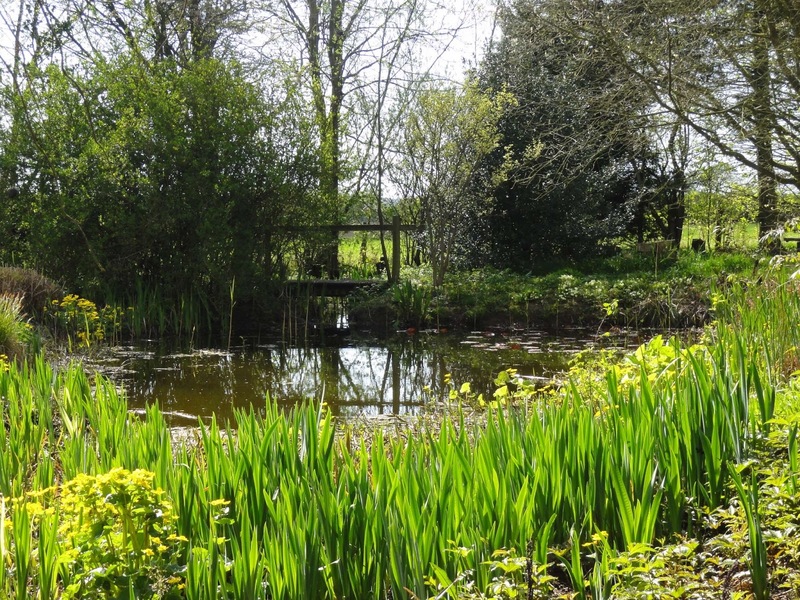 The wildlife pond is well placed in the garden, with taller trees on the north side, with the south side allowing in plenty of light. Marsh marigolds were flowering along the edges of the pond, and I could see that in a few weeks time it will be golden with yellow flag irises. I loved the way the light almost shone through the leaves of the irises. Stillingfleet has several beehives. With so many pollen rich flowers in the garden, the bees don't have far to collect their pollen. I found the wildlife meadow particularly interesting. 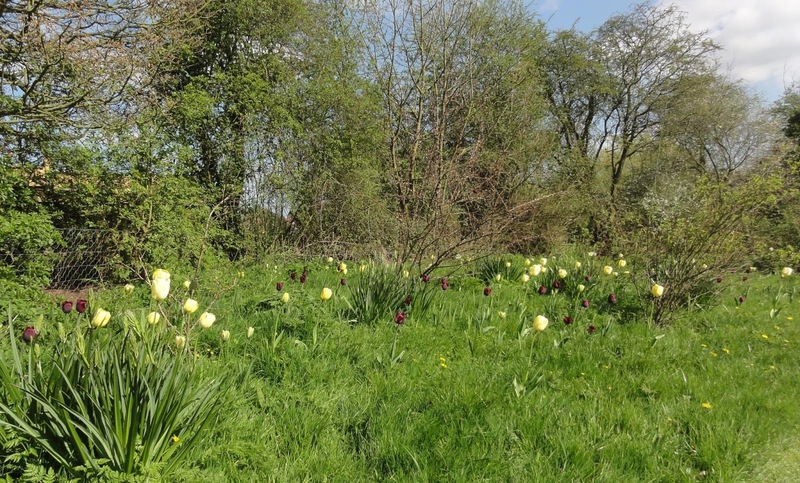 Yes it had fritillaries flowering, but it was also planted with Sanguisorba and Geraniums, amongst other things. 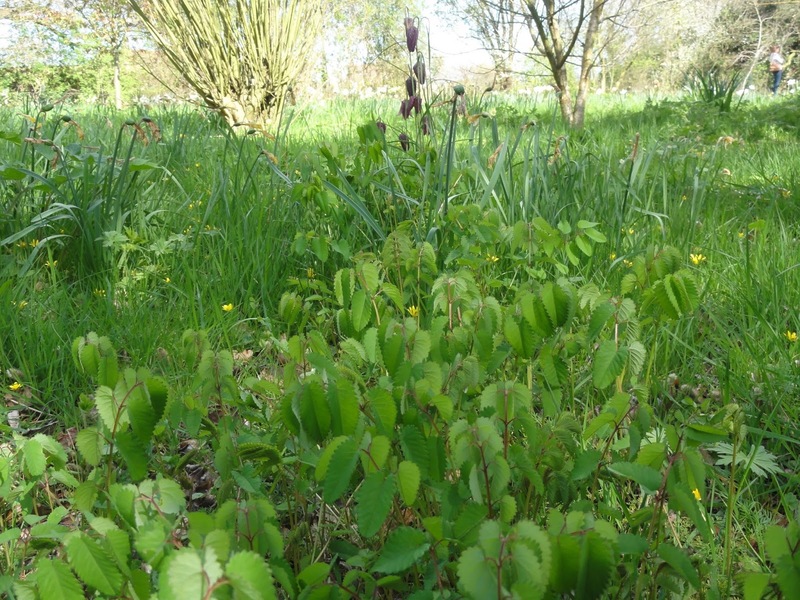 Sanguisorba leaves. The plant will flower in summer. 'Other things' included tulips. I thought it was very clever, as well as attractive, to have pink and white-ish tulips mimicking pink and white fritillaries. On from the meadow is the play area, including a lawn that seemed to encourage Manishta and I to plomp ourselves down and enjoy the sun and sounds. 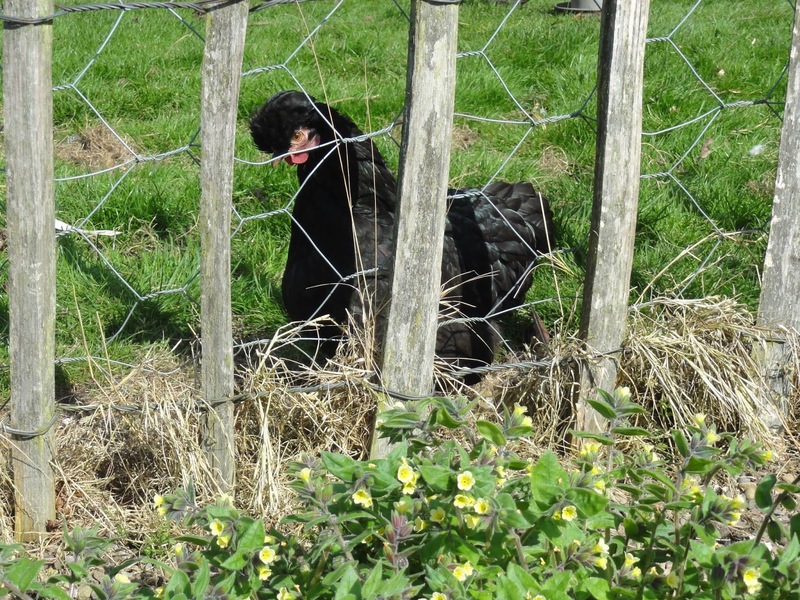 It sits next to the poultry run, and we soon had chickens checking us out, I think in hope for a bit of food. Sorry chook, no food here. Just some humans lying down on the grass looking up at the blue sky. And when not looking at the sky, admiring this pretty yellow flowered plant, similar in looks to pulmonaria (I forgot to write the name down when I saw it in the nursery - doh! ), but preferring full sun. 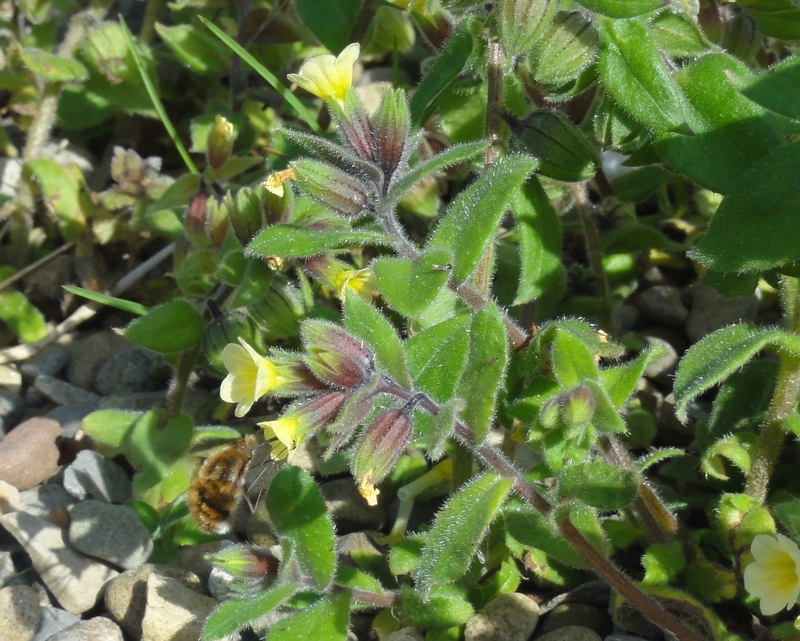 A plant very similar to Pulmonaria, much loved by bees. in the area between the Pulmonaria borders and The Avenue. Once Manishta and I finally dragged ourselves up from the comfy lawn, it was time to visit the nursery. Many of the plants you see in the garden are available in the nursery. This makes a very nice change from other gardens I have visited. I've never really understood this; garden visitors will see plants in the garden that they will want to purchase, surely it makes sense to make these available? Thankfully Stillingfleet is on the right track and the nursery is full of wonderful choices. Perhaps too many wonderful choices? No, not possible, right?! I had to keep my purchases limited as I wasn't prepared for such a good nursery and hadn't the funds to purchase much on this visit. In fact, Kevin bought me the two Epimediums I wanted, Epimedium x versicolor 'Sulphureum' and Epimedium x youngianum 'Roseum'. With the help of Vanessa (and my thanks to her), I purchased a matt-forming geraniaum that I was after, Geranium x riversleaianum 'Russell Prichard'. Manishta picked up quite a few plants, which were fine coming back in the car to Sheffield. Getting them on the train back to Oxford was another matter. But of course when there's a will, a true gardener will find a way. Stillingfleet isn't a particularly large garden, but it is a testament to its gardener, Vanessa, that it feels like it is. I believe this is because it has been designed in such a way that encourages you to amble and take your time. 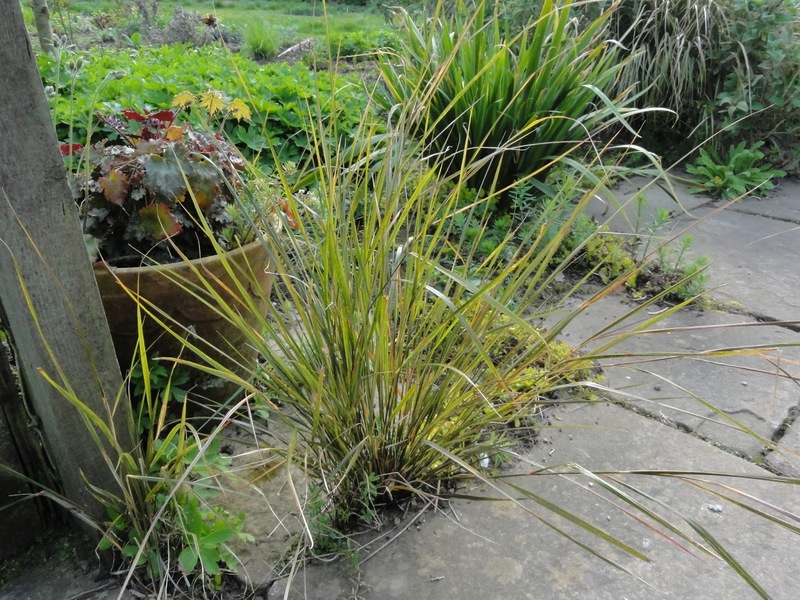 I admit that I tend to favour gardens that welcome wildlife and allow plants to follow their nature, spilling over borders and onto, and in some cases, into, paths. Stillingfleet has this type of planting in abundance, and it was both inspiring and fun to explore. 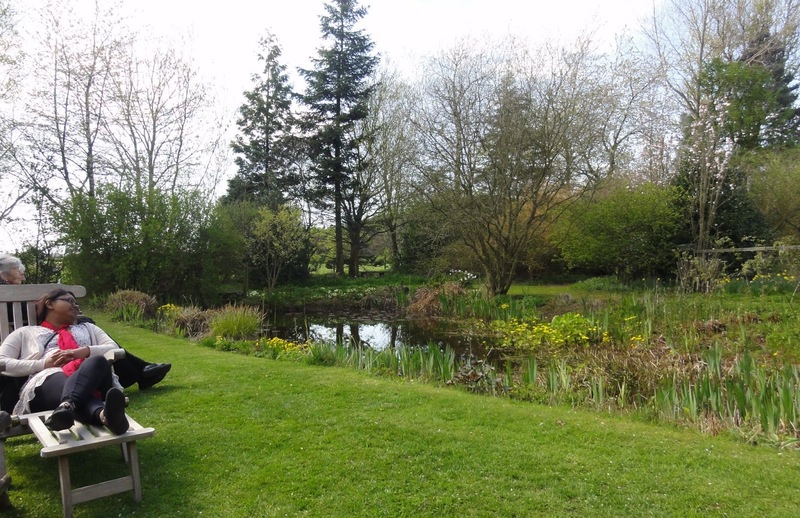 I'll be returning to Stillingfleet in the future to enjoy the garden in other seasons. I also want to take advantage of its wonderful nursery. I'll remember to have more cash on me next time. Lucky you being able to visit Stillingfleet, somewhere I've wanted to go to for a long time. I've read about it many a time and it was good to see it through your eyes.